We fell in love with this adorable swimsuit! It makes your little girl look sassy and sweet like a mermaid! The top of the bathing suit is made with soft, light purple stretchable fabric that ties at the neck. 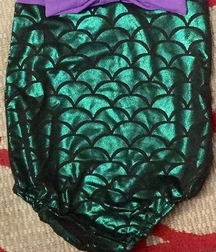 The bottom of the suit is made with shiny green fabric that resembles a mermaid's tail scales! A pretty light purple bow embellishes the front. The back of the swimsuit has a small elastic band across the shoulder blades for better fit. AND, the suit comes with a little headband made of the same two fabrics.